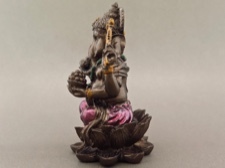 This miniature figurine depicts Lord Ganesha, a widely worshipped and beloved Hindu diety. 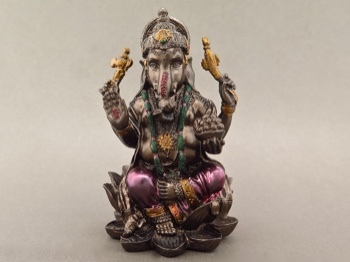 Best know as the Remover of Obstacles, he is invoked at the beginning of every Hindu ritual, any new endeavor, and all spiritual worship. He has the ability to hear even the silent prayers. 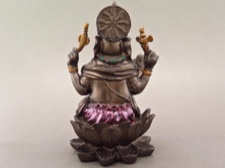 This small, yet symbolic Ganesha is 3.25 inches tall, 2 inches wide, and 1.5 inches deep. He has subtle coloring and intricate detail.